Sleep: Sleep has been pretty good lately. Just getting up occasionally in the middle of the night still but not bad. Movement: Still feeling tiny movements. It's not very regular yet so I'm exited for it to become more consistent. Maternity Clothes? Yes, I've started to notice my regular shirts are feeling a little too short and snug for me lately. 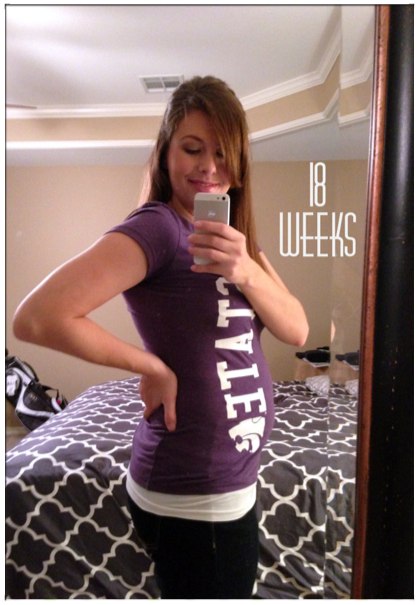 I've been transitioning over to maternity tops because they are just so much more comfortable! Showing: Some angles I look pregnant and other angles I feel like I just look fat. Ready for a rounder belly! Food cravings: Still no real cravings, just done with fruit juice and McDonalds (see unglamorous body changes). What I miss: Ryan had a Cherry Coke the other day and I was so jealous. Why don't they make those in caffeine free non-diet? Strange experiences: Probably just having my first food aversions this week. Best moment this week: Hmmm, not too much going this past week. But I will have to say date night with the hubs! We're trying to get as many in as possible before our lives are completely changed. Looking forward to: Finding out what we are having in 1 week!! Also looking forward to my work trip to San Francisco & our vacation to Vegas for Ryan's 30th birthday all happening next week. Hopefully that will help make the time go by faster until our doctor's appointment! Ahh, so close to finding out, only a week now?! You look freaking adorable. Sorry about getting sick, that's no fun. Isn't it weird how it can just happen out of the blue like that? I think you are definitely looking pregnant now. I can't WAIT to find out what you guys are having! Do you have names picked out yet? Also you look adorable! I'm guessing boy since you can't eat McDonalds. Seriously with LB I could not eat anything like that. It's make me so sick but with AB all I wanted was junk food. Yay to finding out so soon! You look so cute!! I cannot wait to find out what you are having!